A great big shout out to Courtney Humphries, pride of the MIT Graduate Program in Science Writing, class of ’04, who is reading from and taking questions about her wonderful new book, Superdove on the MIT campus. All those of you in the area who want to (a) hear some very cool stuff about one of the most effectively opportunistic of our fellow creatures and (b) watch a very talented science writer (and writer, full stop) spread her wings (sorry, inevitable) in the early stages of what will be a great career should show up in MIT building 32, room 141, tomorrow, Thursday, October 30 at seven p.m.
Interactive map here. Hint: Building 32 is also known as the Stata Center, and it is the Gehry building (aka the melted building) on Vassar St. near its intersection with Main St.
Come if you can. Courtney’s the real deal, and there are few pleasures to match that of seeing one of the good guys making their debut in the big leagues. NY Times review of Superdove here, if you aren’t willing just to take my word for it. 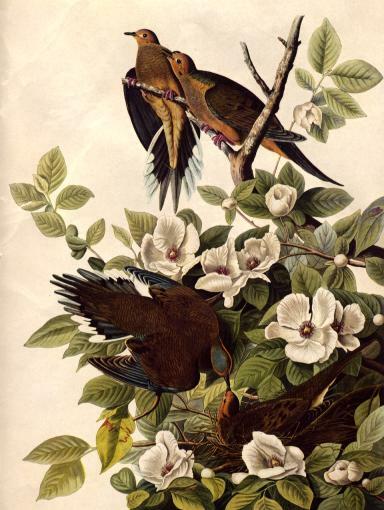 Image: J. J. Audubon, Plate 17 from Volume IV, Audubon’s Birds of America. Pictured are Carolina Pigeons (Turtle Doves), Columba carolinensis, on a flowering bush of Stewartia malacodendron. This entry was posted on October 29, 2008 at 8:18 pm and is filed under evolution, Fauna, good public communication of science, good writing, MIT, science writing. You can subscribe via RSS 2.0 feed to this post's comments.